Ladies and gentleman!! We are one week away from the Super Bowl...who's cooking?!? If you have attended my "Super Bowl Soiree" cooking class this month, then you know how easy and delicious a make-ahead, elevated menu can taste! Beer Cocktails, Cracked Black Pepper Parmesan Dip with Kettle Chips, Buffalo Chicken Garlic Bread, Beef Filet Bites, and Potato-tot Skewers will be the hit of your get together. I'm always so curious to hear each class's favorite Beer Cocktail flavor combination. Each class has been different. Strawberry Daiquiri, Lime-Rita, and Orange Delight never disappoint! The Cracked Black Pepper Parmesan Spread can be made ahead of time. I like to warm the chips and sprinkle some parmesan cheese.....mmmmhmmmmm...that's right. It's important to get the Beef Filet Bite marinade ready early in your prep so that it can soak up all the goodness. This recipe can be adjusted to your taste -- I like to use Sriracha for some heat. I don't recommend store bought minced garlic in a jar. Vacuum sealed or fresh garlic is the way to go. You can't beat the flavor. 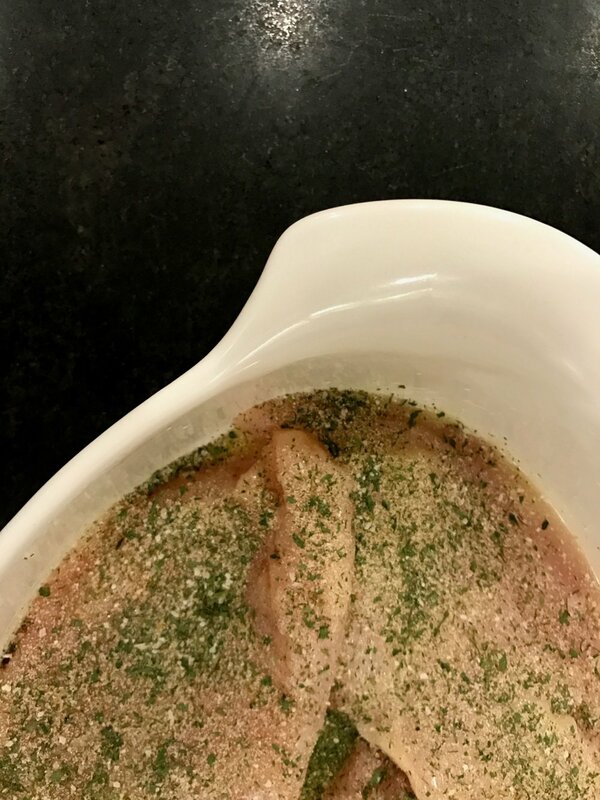 Next, we put a fresh, green dry rub on the chicken breasts before baking in the oven. The dry rub incorporates a traditional ranch flavor that you would expect in a buffalo chicken dish. So simple and so tasty. You could use this chicken recipe for salads, sandwiches, and so much more! I love sharing my best "kitchen hacks". The hack for the Potato-tot Skewers is a good one...I've got to keep it secret until I finish this menu in January. I wouldn't want to ruin the mystery for my final class! Sometimes, my students are intimidated by frying food in the kitchen. This Potato-tot Skewer is easy to fry. Simply fill a wide pot with half vegetable oil/half peanut oil and heat to 350 degrees. The temperature of the oil is important! 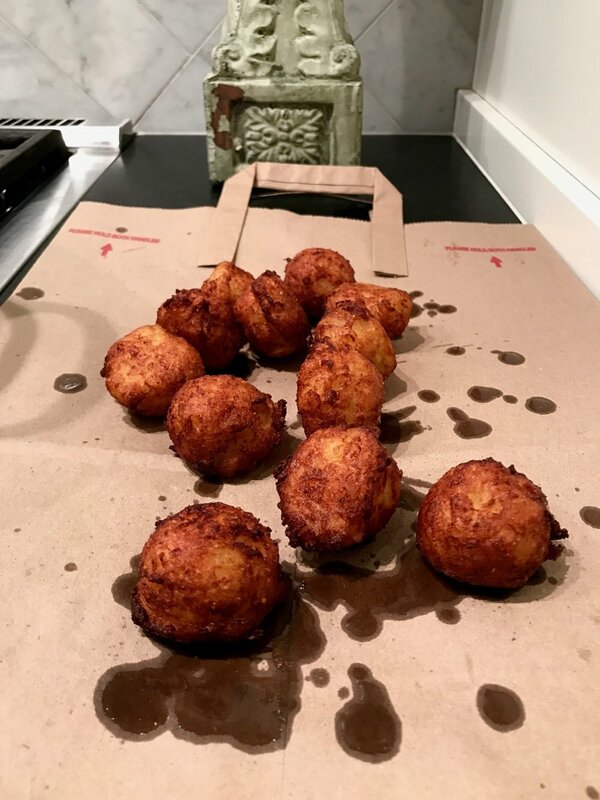 Lay your freshly fried tots on a paper sack. It drains the oil without making the tots soggy. But back to the Buffalo Chicken Garlic Bread...a few layers and suddenly this recipe becomes Pinterest-worthy. Did I mention we wrapped the marinated Beef Filet Bites in B.A.C.O.N.? Um...yes. We did. Sear it seam side down in a skillet and then finish it in the oven. The larger the piece, the more medium it will be. The smaller the piece, the more well done.